The UNMC Genomics Core Facility is a comprehensively equipped facility that provides genomic services on a fee-for-use basis to the greater academic research community in the State of Nebraska. 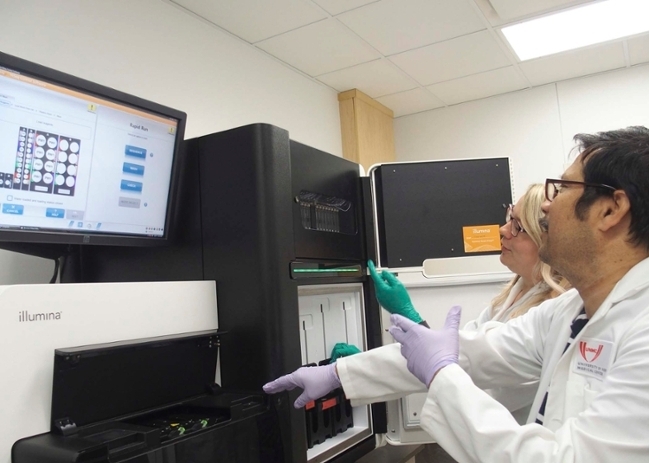 The core provides both Next Generation DNA and traditional Sanger sequencing services. The presence of these cores currently supports the research of over 115 independent laboratories annually. These researchers are involved in a wide variety of scientific projects of both biomedical and basic science relevance. Users of the Genomics Core Facility are obligated to acknowledge the facility in formal publications and presentations which include data generated in the facility. We also appreciate receiving reprints or PDFs of such publications to use in our yearly core facility reports for University of Nebraska Central Administration. "The UNMC DNA Sequencing Core Facility receives partial support from the Nebraska Research Network In Functional Genomics NE-INBRE P20GM103427-14, The Molecular Biology of Neurosensory Systems CoBRE P30GM110768, The Fred & Pamela Buffett Cancer Center - P30CA036727, The Center for Root and Rhizobiome Innovation (CRRI) 36-5150-2085-20, and the Nebraska Research Initiative." 601 S. Saddle Creek Rd.